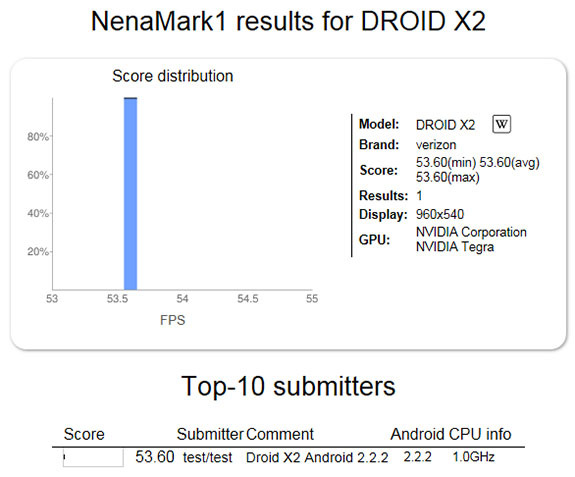 The DROIDX2 appears to have been benchmarked over at Nenamark recently, possibly confirming that it will have a Tegra 2 dual-core processor, which is news we first reported on back in January. It is also showing up with a screen resolution of 960×540 which would suggest that it will have the same qHD screen that will accompany the DROID BIONIC and the rest of Motorola’s new high-end devices. This is good news for a device that was really just looking like a small re-hash of last year’s uber successful original DROIDX. Oh, and about that rumor that it will be a 4G LTE device – I’m still not ready to buy into that idea. Could we still be on for a May release though? Wouldn’t surprise me.